​Chaotic volcanic sediments and dikes eroded into windows, cliffs and interesting shapes; petrified wood viewing; expansive rugged high mountain setting with snowfields, cold trout streams and rivers, hiking, great wildlife viewing in winter with bison, elk, deer, big horn sheep and occasional moose near the road. Generalized geologic map of the Eocene Absaroka volcanic field (modified from Smedes and Prostka, 1972). Black masses represent location volcanic centers discussed by Chadwick (1970). Thick red line shows approximate division between and eastern belts (after Chadwick, 1970). Single dot-dashed line is the boundary of Yellowstone National Park. Red dots mark locations in text. After Feeley, T.C., 2005, EarthScope in the Northern Rockies Poster, Fig. 1. Until the 1950s geologists thought that the Absaroka rocks were part of the Yellowstone volcanic province. A geology graduate student showed that they were entirely different rock types, separated in time by up to 50 million years. 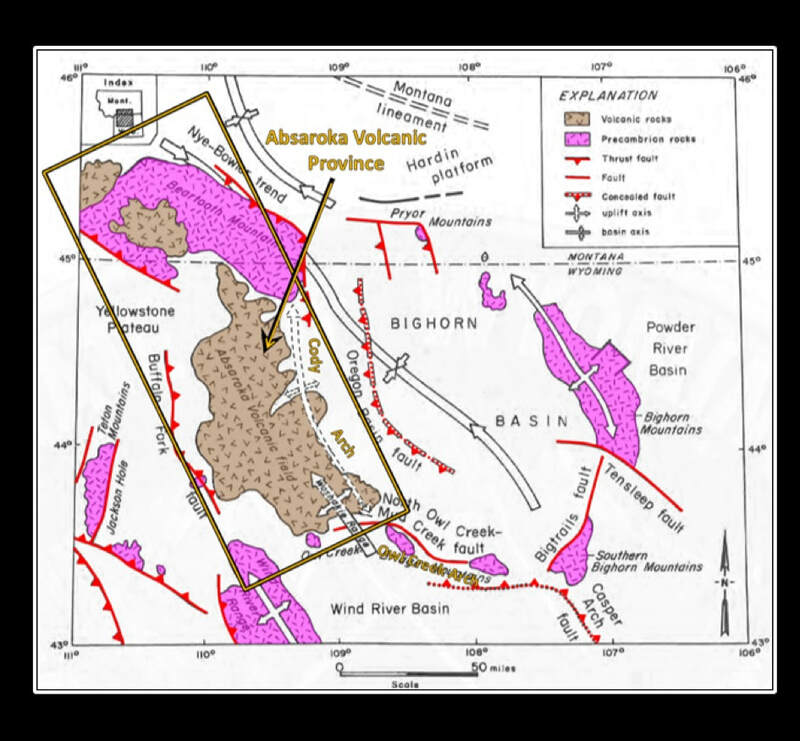 The Absaroka rocks are of two types: the vent facies (those erupted from the volcanos), and alluvial facies (sedimentary rocks composed of eroded volcanic material). The vent facies consist of lava flows and flow breccia that are dipping up to 30 degrees away from the vent. 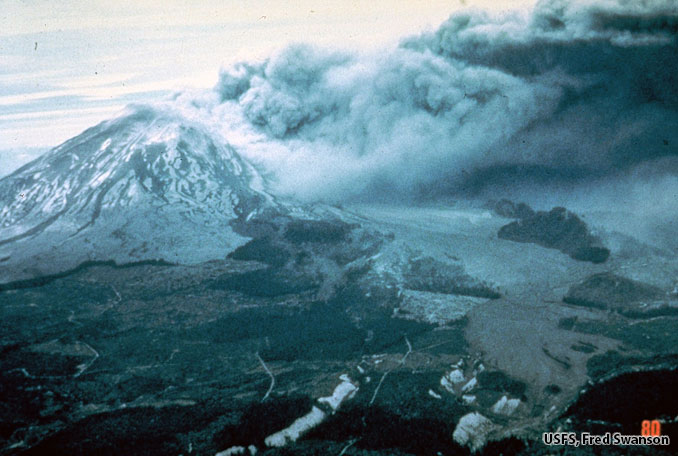 The tilt is due to the original slope on the flank of the growing volcano. Today volcanic centers are recognized by three criteria: rock type, radial dike swarms and intrusive bodies that fed magma to the volcano. The alluvial facies surrounds the eruptive centers with a relatively flat-lying apron of reworked volcaniclastic material: conglomerates, breccia, sandstone and finer clastics. These strata often occur as mudflow deposits that geologists call lahars. 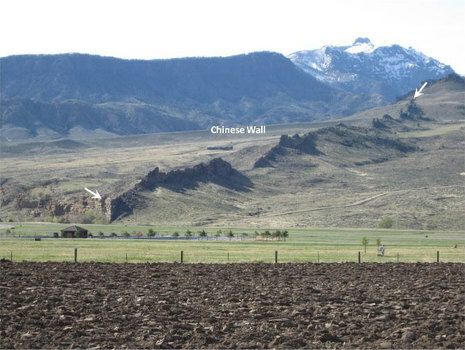 The Chinese wall, two miles west of Wapiti, is a good example of one of these volcanic dikes. The dikes formed when molten rock was injected into the fractures within the mudflows. ​The volcaniclastic sedimentary rocks often erode into bizarre forms known as hoodoos. Many of the hoodoos have names inspired by their shapes. Eight miles west of Wapiti is an area of hoodoos known as the Holy City and Goose rock. 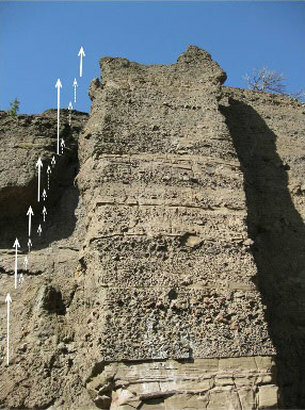 ​Chimney Rock, located 20 miles west of Wapiti, is a North Fork landmark composed entirely of lahar deposits. The individual flows show larger clasts at the top (reverse grading). Flows are capped by fine claystones that settled from water escaping the flows after movement stopped. ​​The Buffalo Bill Scenic Byway (US 14-16-20) follows the valley of the North Fork of the Shoshone River curving around the ancient edifice of the Sunlight Volcano. 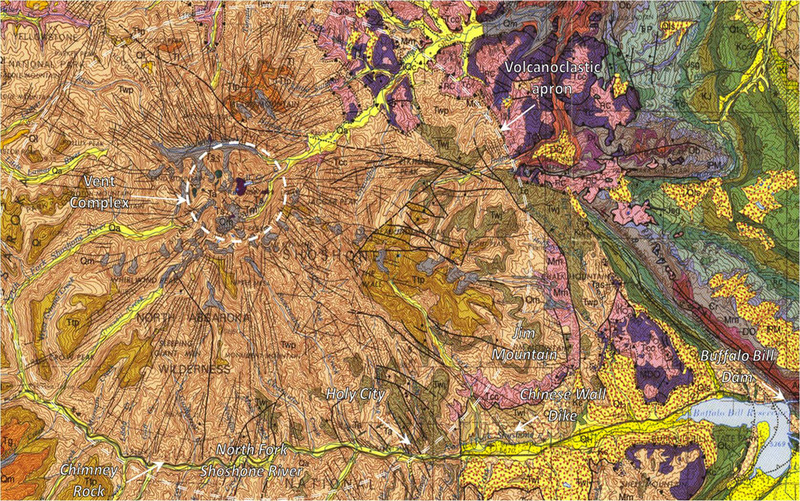 A geologic map shows the central intrusive bodies and the radial dike pattern, like spokes on a wheel, surrounding this vent complex. Fifty million years ago, this volcano looked like Mount Rainier in the Cascade Range. Glaciation of the Absaroka Range was limited to the areas closest to the ice cap that developed over the Yellowstone Plateau and the Beartooth Mountains of Wyoming and Montana. Sunlight Volcano was at the very eastern margin of the ice. Pilot and Index Peaks in the northern part of the Absaroka Range near the northeastern entrance to Yellowstone demonstrate the sculpting action of ice on these volcanic and volcanoclastic rocks. 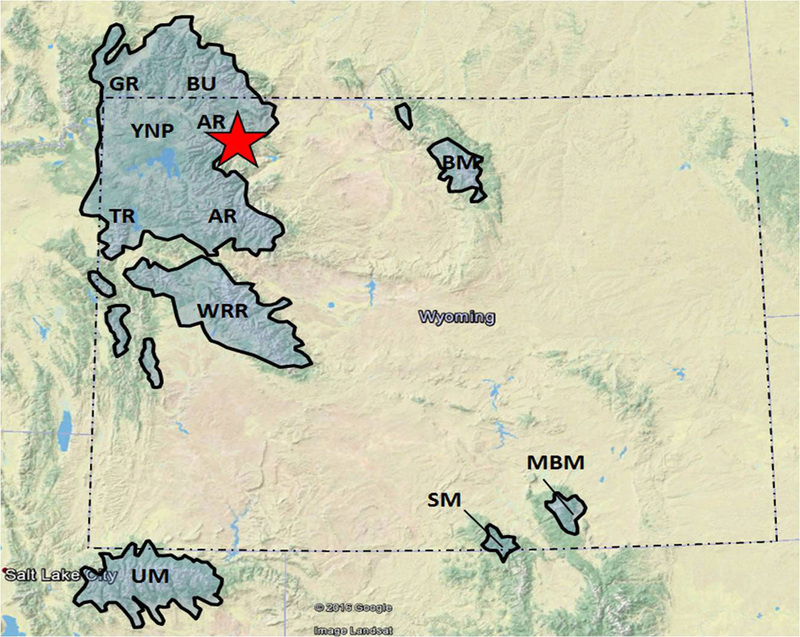 Glaciated portions of Wyoming with the red star marking the approximate location of the Sunlight Volcano. AR= Absaroka Range, BM = Bighorn Mountains. BU = Beartooth Uplift, GR = Gallatin Range, MBM = Medicine Bow Mountains, SM = Sierra Madre, TR = Teton Mountains, UM = Uinta Mountains WRR = Wind River Range, YNP = Yellowstone National Park. Overlay: Data from Pierce, K.L., 2003, Developments in Quaternary Science, Fig.1, p. 64. 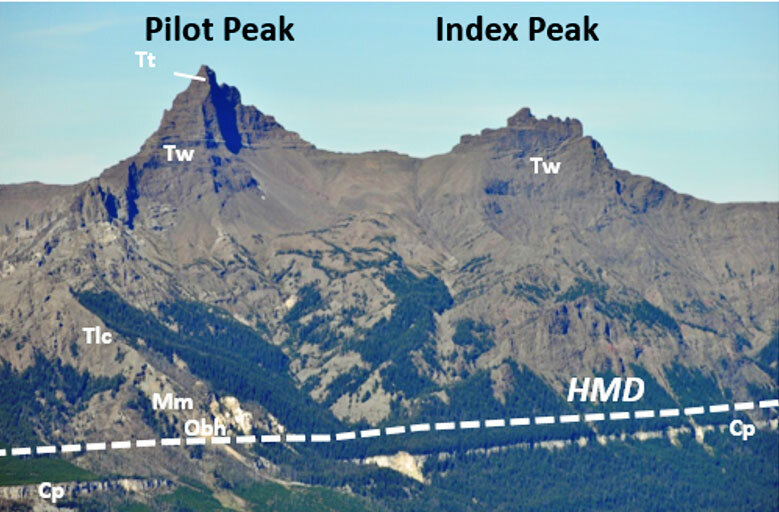 Glacially sculpted Pilot and Index Peaks with approximate location of the Heart Mountain Detachment (HMD) shown by white dashed line. Formation codes: Tt = Trout Peak Trachyandesite, Tw = Wapiti, Tlc = Lamar River and Cathedral Cliffs undivided, Mm = Madison, Obh = Bighorn, Cp = Pilgrim Limestone. Note Pilgrim Limestone outcrop lies below the Heart Mountain Detachment (HMD) and was not involved in the detachment. A trip anywhere through the Absaroka Range is a trip through the fossil remains of a once massive volcanic field. 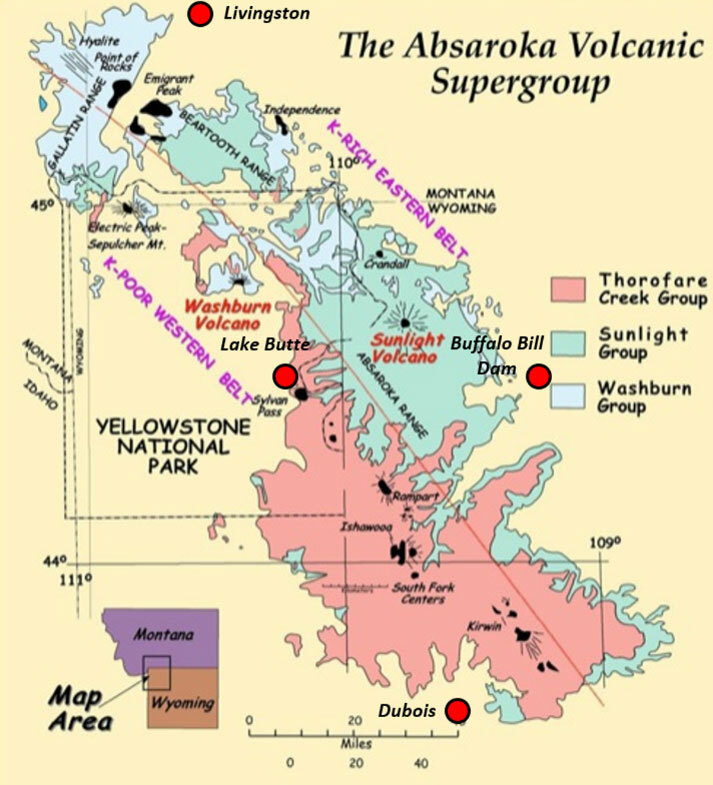 The Absarokas erupted in a time after the Rocky Mountains were uplifted and long before the first volcanic stirrings of Yellowstone. 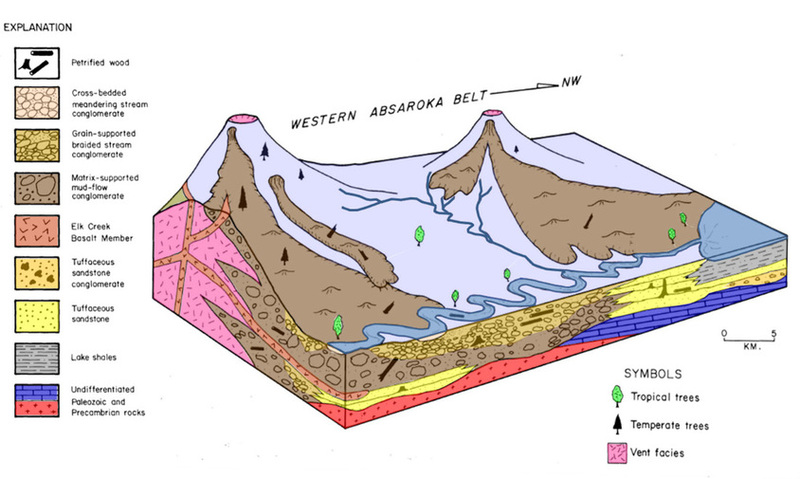 Numerous detachment structures occur within the Absarokas including the world’s largest subaerial land slide (see Geowyo Heart Mountain page), that occurred 48.87 million years during the peak period of Absaroka volcanism. The Absaroka Volcanic field has been extensively eroded down by wind, water and ice, yet they still contain 47 peaks with elevation over 12,000 feet and 76 more that rise above 11,500 feet. The province is also the watershed for the Yellowstone, Snake, Wind, Bighorn, Greybull and both forks of the Shoshone rivers. 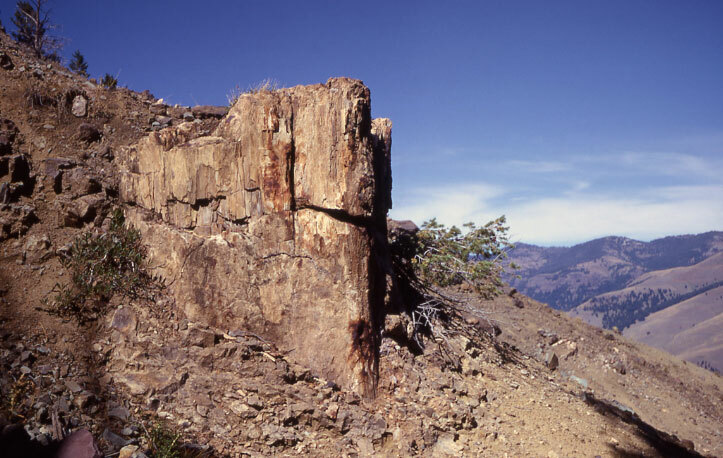 The famous petrified forests located in the north and northeast parts of Yellowstone National Park are a product of the Absaroka Volcanic Province (see photo below of Yellowstone petrified tree on Specimen Ridge). Yellowstone’s petrified trees occur within Absaroka volcanic rocks approximately 50 million years old. They are the result of rapid burial and silicification, not volcanic eruptions. Block diagram showing depositional environments for Yellowstone’s “fossil forest.” After Fritz, W. J., 1982, WGA, Fig. 23, P. 99. Petrified logs located on back side of ridge above Buffalo Bill Boy Scout Camp seven miles east of Yellowstone on North Fork of the Shoshone River. No collecting. Save this for future generations! ​The 52 mile drive from Cody to the east entrance of Yellowstone Park is especially scenic and goes through the heart of the Absaroka Volcanic Province along the North Fork of the Shoshone River. There is a lot of outdoor opportunity since most of it is public land managed by the Bureau of Reclamation, Wyoming State Parks, BLM, Forest Service and National Park. Our geology recommendation is to look for cobble-sized petrified wood on gravel bars along the Shoshone River starting at the Forest Service boundary at about 24.8 miles west of Cody all the way to the East Gate of Yellowstone. You might consider combining looking at petrified wood with fishing since this is prime trout fishing water. Ancient forests on the slopes of the volcanoes were repeatedly smothered in mud and lava flows. After burial, the organic matter in the wood was slowly replaced by minerals and became rock. Recent erosion and transport rounded the petrified wood into cobbles. High water from spring snow melt exposes new material every year. Search the large gravel bars that are walked the least; not the ones next to the numerous Forest Service campgrounds. We have luck on almost all the gravel bars, but if you need a defined spot, try the large gravel bar just downstream of the Horse Creek picnic area at 28.0 miles. The Shoshone National Forest does not allow keeping any petrified wood for personal or commercial use. 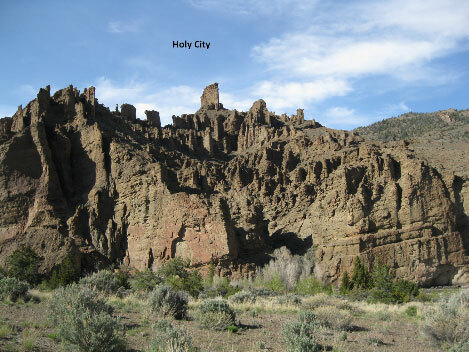 Volcanic depositional and erosional features are nicely exposed at the Holy City (see photo above) at 27.1 and 27.5 miles. 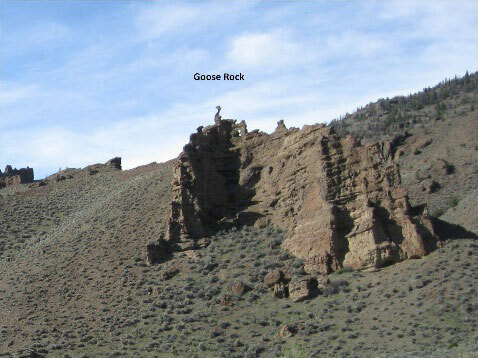 Chimney Rock (see photo above) can be viewed at a pull-off at 40.7 miles. These stops contain volcanic sediments that were deposited by streams and chaotic mud flows coming off the volcano. 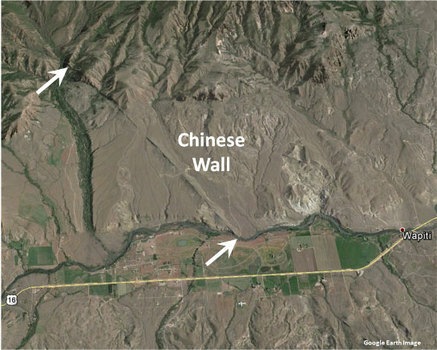 The Chinese Wall, an intrusive dike radiating from the Sunlight volcano can be seen on the north side of the valley at 22.3 miles (see photos and geologic map above). If you would like to take a hike, the Blackwater Fire Memorial Trail at 36.9 miles is an out and back ten mile total hike with 2,200 feet elevation gain. It is a day hike mainly through forest that gains elevation to the point of good views near the end. Blackwater Natural Bridge, one of the largest arches in the world can be seen in the far distance from where the trail starts to switchback. The destination is a memorial for the 15 fire fighters that died in the 1937 tragedy. This is also a mountain biking trail that can be described as lots of cardio and fast on the way down. See the MTB Project website for details on mountain biking this trail (http://mtbproject.com/trail/2997410). 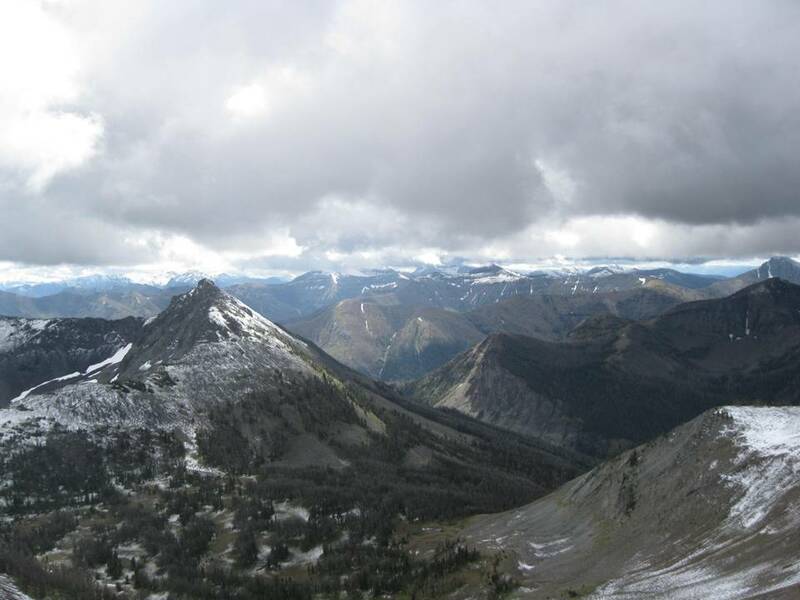 Possibly the best hike in the entire Cody area is Avalanche Peak and the trail starts at 59.9 miles, which is just less than a mile beyond Sylvan pass within Yellowstone National Park. It is a strenuous half-day hike. Parking area is on left and trail starts on right. Alternate lower key hikes can be found at Elk Fork trail at 30.0 miles or Eagle Creek trail turnoff at 45.2 miles. Both Elk Fork and Eagle Creek start at campgrounds. For Eagle Creek trail, cross the Shoshone River on the footbridge, turn left/downstream for 100 yards and past the cabins, turn right and hike up Eagle Creek as far as you want. This trail goes up Eagle Creek for miles. All of these hikes are in Grizzly bear country. Hike and bike with a partner and take your bear spray! ​Starting at the intersection of US 14-16-20 (Sheridan Ave) and US 14A (16th St) in downtown Cody, head west toward Yellowstone on US 14-16-20. Travel through town, 0.8 miles Buffalo Bill Center of the West, 2.8 miles Old Trail Town, 3.2 miles Rodeo Grounds – Stampede Park, 5.1 miles Hayden Bridge – Bureau of Reclamation road and walk, 5.7 miles bridge over Shoshone, 6.4 miles Precambrian-Cambrian Great Unconformity (see Geowyo The Great Unconformity page), 6.5 miles first of three tunnels, 7.3 miles exit third tunnel, 7.4 miles Buffalo Bill Dam (see Geowyo Buffalo Bill Dam & Rattlesnake Mtn page), the Dam Visitor Center and the walk atop the dam is open May through September, 10.3 miles Buffalo Bill State Park HQ entrance and North Shore Campground, 14.9 miles road 6KV to south side of reservoir, view to south of Sheep Mountain has good exposures of Paleozoic carbonate blocks of the Heart Mountain Detachment (see Geowyo Heart Mountain page) sitting on Cretaceous sediments, 18.3 miles views of volcanics overlying Eocene Willwood shales and siltstones, 19.3 miles Jim Mountain Road 6GV leads to Forest Service trailhead, very strenuous all day hike that climbs 4,100 vertical feet to summit of Jim Mountain, 20.2 miles bridge over Shoshone, 20.5 miles Wapiti School, 22.3 miles Chinese Wall intrusive dike (see photo above), 23.0 miles Green Creek Road 6DU, 23.2 miles unfinished Smith Mansion log house on hill, 24.8 miles Forest Service boundary, 27.1 miles Holy City pull-off (see photo above) , 27.5 miles 2nd Holy City pull-off, 28.0 miles Horse Creek picnic area with petrified wood on gravel bar just downstream, 29.4 miles Wapiti Ranger Station, the oldest Forest Service ranger station in the US, continuously used since 1903, 30.1 miles Elk Fork Campground and hike or mountain bike up Elk Fork trail, 36.1 miles bridge over Shoshone with Mummy Cave, an archeological site in the rock overhang on right (https://en.m.wikipedia.org/wiki/Mummy_Cave), 36.9 miles Blackwater Firefighter Memorial (https://en.m.wikipedia.org/wiki/Blackwater_fire_of_1937) and trail, 40.7 miles Chimney rock (see photo above), 45.2 miles Eagle Creek Campground and Eagle Creek trailhead, 48.4 miles Sleeping Giant ski area and zip line, 49.9 miles Pahaska Teepee, Buffalo Bill’s historic resort, 52.2 miles east gate Yellowstone National Park, 59.1 miles Sylvan Pass at 8,524 feet, 59.9 miles parking area on left for Avalanche Peak, trailhead across the highway to my absolute favorite hike in the Cody area. This is a fairly strenuous half-day hike to top of Avalanche Peak with 2,150’ elevation gain. Great views! Take bear spray, a partner and start early so you are not caught in afternoon lightning. No dogs or bikes on this one.